It's two years after the events of Girl, Missing and life is not getting any easier for sixteen-year-old Lauren, as exam pressure and a recent family tragedy take their toll. Lauren's birth mother takes Lauren and her two sisters on holiday in the hope that some time together will help, but a few days into the holiday one of the sisters disappears, under circumstances very similar to those in which Lauren was taken years before. Can Lauren save her sister, and stop the nightmare happening all over again? I really enjoyed Girl Missing so was excited to find it was going to become a series. I relished the opportunity to catch up with Lauren, Jam and Madison! It's been two years since we last saw these characters and it was great spending time with them. Lauren is exactly how I remembered her - strong, fiercely independent, a tad selfish at times but really, really kind once you dig that little bit deeper. And how much do I love Jam? He is just full of complete awesome. The story was really exciting with all the different twist and turns I have come to expect from a Sophie Mckenzie novel. I LOVED the scenes towards the end - I was really worried for Lauren, Jam and Madison! There were a few things that I saw coming - but I have to say the ending completely blindsided me! Really, really good.! 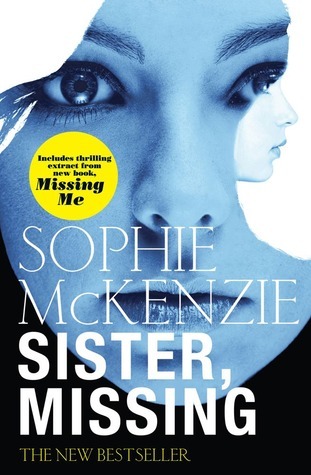 I can't wait to read Missing Me - and I'm really looking forward to having the story narrated by Madison. I read Girl, Missing and loved it, but somehow I never got round to reading this. After reading your review, I think I'll have to hunt the library for it!